As she graduates from SU this spring with a dual major in Russian language, literature and culture from the College of Arts and Sciences and in geography with a minor in security studies from A&S and the Maxwell School of Citizenship and Public Affairs, she is well on her way to achieving that goal. Rhoads has been named a 2018 Thomas R. Pickering Graduate Foreign Affairs Fellow and plans to attend the Fletcher School of Law and Diplomacy at Tufts University in Medford, Massachusetts, this fall. She is one of only 30 recipients chosen from hundreds of applicants from more than 200 colleges and universities around the nation. 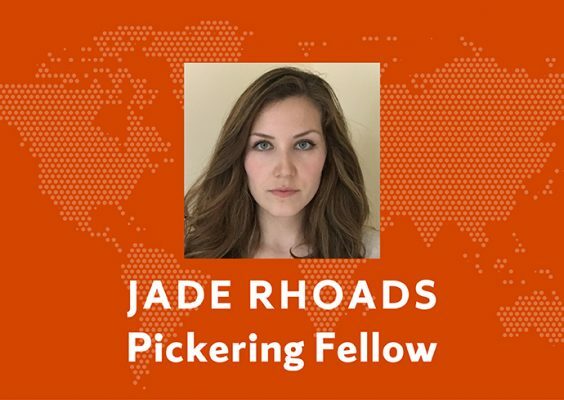 Funded by the U.S. Department of State and administered by the Washington Center, the Pickering Fellowship awards recipients two years of financial support, mentoring and professional development to prepare them for a career in the Foreign Service. Fellows also complete a domestic internship at the U.S. Department of State in Washington, D.C., and an overseas internship at a U.S. embassy. Rhoads is also the recipient of a Critical Language Scholarship, also funded by the U.S. Department of State, and will spend the summer in Kyrgyzstan. There, she will participate in an intensive Russian language program at the American University of Central Asia and stay in a local home to practice her speaking skills. Rhoads attended a one-week mandatory Udall Scholar orientation in Tucson. “It was wonderful. All the scholars were interesting and motivated, and a lot of the activities were centered on leadership, negotiating and building that core network and support system Udall is known for,” she says. Rhoads also attended a Native Nation Building three-day workshop in Tucson prior to the start of the Udall Scholar orientation.